Back in january, I did some posts on the amount of debt and interest payements in the European Union based on the EuroStat database numbers. I showed that with total government debt at €9.8 trillion, the banks were able to cash in €332 billion in interest payments. But the numbers were based on the figures for 2010. I've just redone the calculations using the latest figures that cover 2011 too. Here they are. 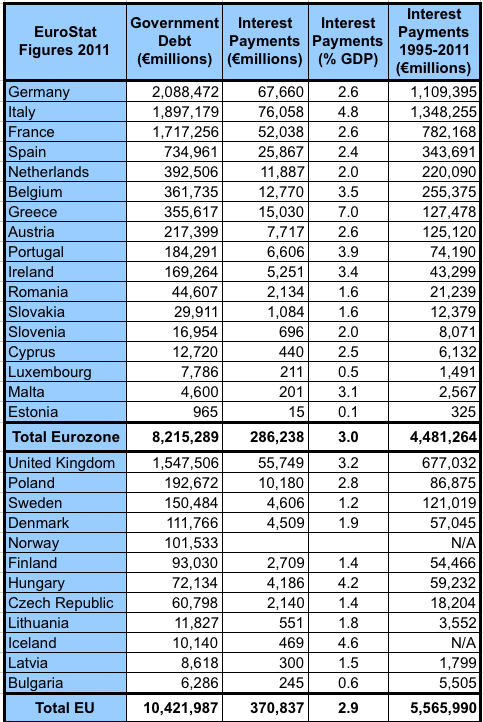 If you don't believe me, feel free to download all the data from the EuroStat site. It requires a bit of fiddling around, but the numbers are there. You'll no doubt be delighted to hear that total government debt in the EU has now reached €10.4 trillion. Yep, an extra €610 billion compared to 2010. And guess what that means? It means that our friends in the banking system have been able to cash in a further €370.8 billion in interest charges. That's an 11% increase since 2010. No wonder the bankers are able to pay themselves huge bonuses. That's 2.9% of the GDP of the European Union that goes directly to pay interest charges. And of course, if you are in Greece, you'll no doubt not be surprised to learn that the number has reached 7.0% of GDP. But even in the UK, a generous 3.2% of GDP is used to pay the banks their interest. I also include a column where I added up all the interest payments for the period from 1995-2011. That has now reached a mind-blowing €5.6 trillion. The entire european economy is being sucked dry by the "blood-sucking vampire squids". Now the truly amazing thing about this is that most of trillions of euros that the banking system has lent to European Governments over the last decade was money that the banks didn't actually have to lend. They have managed to get a system in place where they have the right to create money (debt) out of thin air, lend it to governments with essentially no risk whatsover, and sit back and wait for the money to roll in. Does this sound insane to you too? It certainly does to me.